Athletes and runners in Florida only get to see small differences in their activewear wardrobe or running fashion through the four seasons. The Sunshine State only has two seasons…really hot and not that hot. We kept this in mind as we designed the winter collection for F2R Apparel this year, where we created activewear and running apparel that is perfect for warmer weather, year-round. These trendy clothes capture the latest and most popular styles while fulfilling your comfort and running needs. The lightweight fabrics and performance technology in our pieces will keep you cool and dry, so you can focus on getting in your best run. The color palette for the Women’s Collection is icy pinks with pops of geometric print, go with anything gray and on trend pine. With staples in timeless black and white to round out the collection you can build a fashionable and modern running wardrobe at a great price. With prices much lower than you’d find in comparable athletic retailers, you can get great performance fashion and basics at a great value. Club Fit2Run Members save even more, with 20% off F2R retail prices every day! The Pieced Crop Tight will be your new go to crop. This bottom features multiple pockets for hair ties, cards and even your phone. The wide waist band makes these tights super comfortable and universally flattering. With a mid-rise and 20” inseam it’s the perfect length for chilly mornings, but with mesh panels on the back of the calf for ventilation as the temperatures heat up. The Bimini II Short is the latest update to one of fan favorites. With an improved fit, and all the pockets you’ll ever need, these shorts are sure to be one you’ll put a lot of miles in. 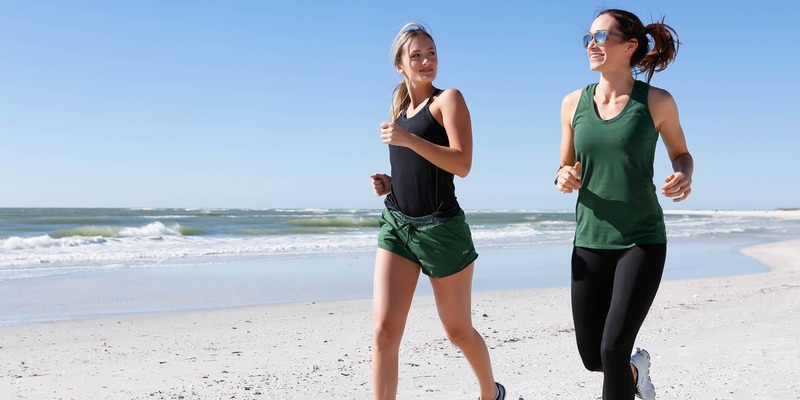 The 3” inseam and lightweight liner with a mid-rise and breathable fabric, make this the perfect short for Florida running. The Eclipse Sun Protection Tech Tee features feminine cap sleeves and a scoop neckline. The mesh side panels, key hole back and lightweight fabric make this top super breathable and functional. With 50+ UPF Protection and a relaxed fit, this tee is great for any Florida lifestyle. If you love to run in the sun and show off those shoulders, you’ll love the T-Low Tank. A performance top that features barely-there adjustable straps fits like it was made just for you. The lightweight fabric and athletic silhouette cater to any body type and keeps you cool on the run. For a sporty look perfect for before, during and after a workout, you’ve got to try the Basic Kate Tank. Made with a cotton-polyester blend this super soft tank has a classic racer back silhouette and athletic fit. Dress it up with a jacket or cardigan for the office and then go straight to yoga or a short run after work.